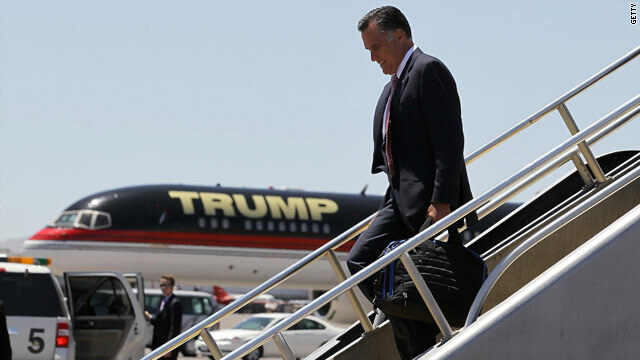 Mitt Romney, the likely GOP presidential nominee, arrives Tuesday in Las Vegas, where he will attend a fund-raiser hosted by Donald Trump. Trump's plane stands in the background. Obama campaign: Why doesn't Romney push back against Trump ‘birther’ questions? Washington (CNN) – President Barack Obama's campaign is highlighting what they call Mitt Romney's "refusal" to condemn Donald Trump's continued highlighting of the "birther" conspiracy. Romney has said in the past that he firmly believes Obama was born in Hawaii, and is thus constitutionally eligible to be president. Trump, however, is decidedly less sure. The "Apprentice" host has been a vocal proponent of the "birther" conspiracy going back several years. And early last year, as Trump flirted with his own bid for the Republican presidential nomination, he claimed he had "investigators" looking into Obama's records in Hawaii. The president released the long-form version of his birth certificate in April 2011, showing he was born in Hawaii on August 4, 1961. Soon after it was released, Trump announced he would not make a bid for the GOP nomination. The new video by the Obama campaign contrasts Romney with Sen. John McCain of Arizona, the last Republican presidential nominee. The video starts by saying "As Republican nominee, John McCain stood up to the voices of extremism in his party." Then McCain is seen in clips from the 2008 presidential campaign pushing back against supporters’ claims that Obama wasn't an American. In one of the clips, a woman speaking to McCain at a campaign event says, "I have read about him, he's an Arab.” McCain shakes his head and responds "No ma’am, no ma’am. He's a decent family man, citizen, that I just happen to have disagreements with." The video then asks, "Why won't Mitt Romney do the same" and proceeds to highlight clips of Trump over the past year questioning whether the president was born in the United States. Trump will join Romney and former presidential candidate Newt Gingrich for a campaign fund-raiser in Las Vegas on Tuesday evening. Romney's campaign is also raffling a chance to have dinner with the celebrity businessman for supporters who donate $3 to the campaign. "I want you: Dine with the Donald," a campaign flier proclaims, along with a drawing of Trump in the pose of Uncle Sam. Trump once again raised questions about Obama's birthplace last week, including in an interview published Friday with The Daily Beast. "Look, it's very simple," Trump said in the interview. "A book publisher came out three days ago and said that in his written synopsis of his book." The interview continued, "He said he was born in Kenya and raised in Indonesia. His mother never spent a day in the hospital." Trump was referring to a literary agency that, in a promotional catalogue from the 1990s, listed Obama has having been born in Kenya. An employee of the agency recently acknowledged that it was her mistake. But Trump isn't buying it. "Now they're saying it was a mistake," he told the Daily Beast. "Just like his Kenyan grandmother said he was born in Kenya, and she pointed down the road to the hospital, and after people started screaming at her she said, 'Oh, I mean Hawaii.' Give me a break." - CNN's Rachel Streitfeld, Kevin Liptak, Paul Steinhauser and Jessica Yellin contributed to this report. Mormon Mitt is going to regret that picture. Donald Trump is a one-way ticket back to Malibu for Mormon Mitt. It is time for the Democrats to play the Mormon card. Do a wiki search on Parley P. Pratt, Mitt Romney's great grandfather. You won't believe it. @sue, what debate, you think without debates he got elected to presidency? Quit your idiocy.....yes on obama12. FYI liberals........"Anyone" can pay to put "any" ad in "any" newspaper. I suspect that this was done in order to receive some type of benefits, that only the natural born child of a US citizen is able to receive. Whatever way anyone believes, the stench of the birther claims is one no politician wants wafting through the air; most ote polls that I have seen so far give zero credence to the the conspiracy – and even if Romney believed there is no way he's ever going to say it out loud. Bottom line, somewhere along the way, Obama has LIED about his birthplace to suit his own needs for personal gain. Whether it was lying in 2008 during his campaign for president, or lying in the 1990's to promote his book doesn't really matter. Most of us don't really care where he was born, but the fact that he LIED about it at some point in the past speaks volumes to the character of the man. He's a liar and a crook and should not be holding the office of the president. If Trump's "Prenatal Conspiracy Theory" was true, it would mean that Obama began conspiring to become the President of the United States while he was still a fetus. That's a good trick, and much more impressive than anything Romney did as a fetus. Every time I see Trump with Romney I think of the dancing midgets in O Brother Where Art Thou? Junior O'Daniel: We could hire our own midget, even shorter than his. Pappy O'Daniel: Wouldn't we look like a bunch of Johnny-come-latelies, bragging on our own midget, doesn't matter how stumpy. I like the add where we see "President Romney". Since he already purchased the presidency I guess the election is a formality. Will the Birthers Scrutinize Marco Rubio's U.S. Citizenship? In the end, the contempt that Trump, Romney, and their fellows feel for the common American will be their downfall; the number of Americans greedy, ignorant, cowardly, or just plain stupid enough to vote for Romney are nowhere near 50.1%. All this continuing flap over non-issues, lies and rumors. Has it occured to anyone that the more trash thrown in the air about birth certificates, college transcripts, ad nausium obscures the real facts that Romney has not released his tax returns, hasn't disclosed any information about his wealth stashed away in accounts in Switzerland or the Caymen Islands. For that matter,we haven't seen Romneys birth certificate, college transcripts or details of his involvement in the Mormon chruch's government either. But mostly it his his secret, tax evading financial world we should know about. But as long as the GOP can keep the public attention on birth certifacates the more likely they are to get away without asnswering those questions. They'd rather risk getting flack over the relationship with Trump to keep the controversy away from Romney's personal finances.